Perseus was an ancient Greek hero. His mother was Danae, the daughter of Acrisius, the king of Argos. When a prophecy revealed to Acrisius that his grandson would kill him, Acrisius imprisoned his daughter Danae to keep her chaste. Zeus, however, fooled Acrisius' precautions by entering the prison disguised as a shower of gold. When Acrisius discovered that Danae had given birth to Perseus, he had the mother and the son thrown into the sea in a chest of wood. Luckily they reached the island of Seriphos where the king Polydectes offered them hospitality and protection. Perseus was secretly raised on the island and became a courageous young man. He was sent to complete a dangerous mission. Perseus had to fetch the head of the Gorgon Medusa, a terrible monster who had laid waste the country. She was once a beautiful maiden whose hair was her chief glory, but as she dared to vie in beauty with Athene, the goddess deprived her of her charms and changed her beautiful ringlets into hissing serpents. Medusa became a cruel monster of so frightful an aspect that no living thing could behold her without being turned into stone. All around the cavern where she dwelt might be seen the stony figures of men and animals which had chanced to catch a glimpse of her and had been petrified with the sight. Perseus, favored by Athene and Hermes, the former of whom lent him her shield and the latter his winged shoes, approached Medusa while she slept, and taking care not to look directly at her, but guided by her image reflected in the bright shield which he bore, he cut off her head and gave it to Athene, who fixed it in the middle of her Ægis. After cutting off Medusa’s head, Perseus started his journey back to his home. On the way, he encountered a beautiful woman named Andromeda chained to some rocks. He learned from her that her mother, Cassiopeia, had offended Poseidon by stating that her own beauty was greater than the Nereids who attended Poseidon. To punish her, Poseidon had sent a flood and a sea serpent to harass the people of her country. An oracle had told Andromeda’s father, King Cephus, to sacrifice his Andromeda to the serpent to appease Poseidon. Andromeda begged Perseus to save her. 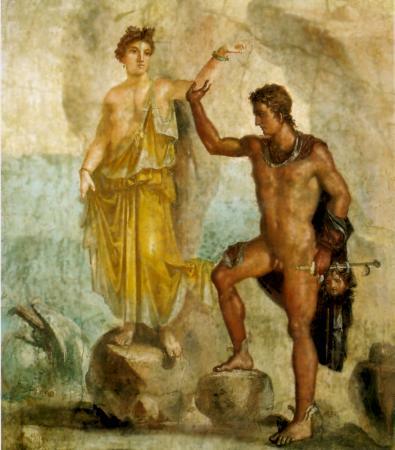 Perseus agreed to help her, but first he wanted King Cephus to give him Andromeda’s hand in marriage. Cephus agreed. When the sea serpent came for Andromeda, Perseus jumped on top of it and battled it to the death. Perseus was victorious and he then freed Andromeda. He went to her father to claim her in marriage, but Cephus had failed to disclose that Andromeda had already been promised to Phineus. Phineus, with a small army, came to interrupt Perseus and Andromeda’s wedding. Perseus handled this by pulling Medusa’s head out of the bag and turned Phineus and his army all to stone. Upon returning home, Perseus found his mother hiding from the King in a temple. King Polydectes had begun pursuing her, which forced her to retreat to the temple for refuge. Perseus crashed a banquet of the king. When Perseus told his tale and how he had cut off Medusa’s head, the king doubted his story. To prove the deed was actually done, Perseus pulled the head out of the bag. The king and all his guests were turned to stone. Perseus, Andromeda, and Danae (his mother) returned to their home at Argos. Acrisius, afraid of the prophecies that his grandson would kill him, fled to Larissa. Perseus followed him to Larissa, not for revenge, but to make peace with him. While there, Perseus entered a disc-throwing contest. He accidentally threw the disk into the crowd and killed one of the spectators. He discovered the spectator was his grandfather Acrisius. So saddened by this accident, Perseus could not retun to Argos to claim his throne. Instead, he took the throne of the city of Tiryns and there he established the city of Mycenae. He and had six children with Andromeda to whom he was faithful the rest of his life.